If you want to know how to grow chrysanthemums in pots, read below. Growing chrysanthemums in pots is quite easy if you know what to do and how? Chrysanthemums are one of the most recognizable flowers in autumn. 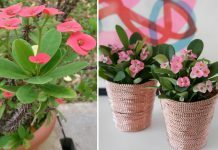 They can be grown at home, on the balcony and terrace or in the garden. Other Names — Anthemis grandiflorum, Anthemis stipulacea, Chrysanthemum indicum, sevanti, Chrysanthemum sinense, Chrysanthemum stipulaceum, Chrysanthemum morifolium, Crisantemo, Dendranthema grandiflorum, Dendranthema morifolium, Fleur d’Or, Florist’s Chrysanthemum, Flos Chrysantemi, Ju Hua, Matricaria morifolia, Mum, Yao Jiu Ha, Ye Ju Hua. Chrysanthemum belongs to aster family and has about 50 species. It is native to East Asia. There are countless colors, shapes, and sizes of chrysanthemums- from tiny spheroids to starry and stately, giant single flowers. They are the most famous flowers after roses. The most popular variety is Chrysanthemum x Grandiflorum. This includes the hardy chrysanthemums that are frost-resistant or partially resistant to frost. These varieties are suitable for cultivation on the ground. 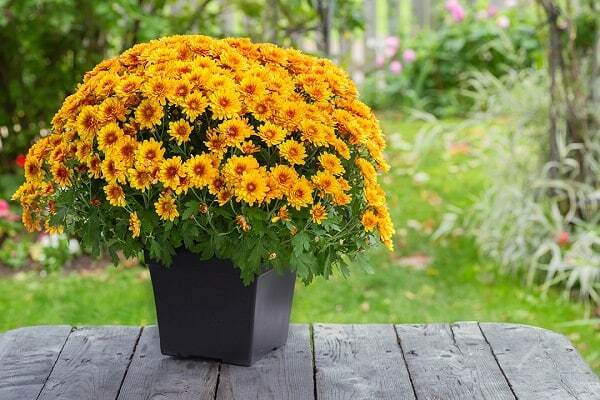 Pot mums/Florist’s mums are best if you want to grow chrysanthemum in pots. 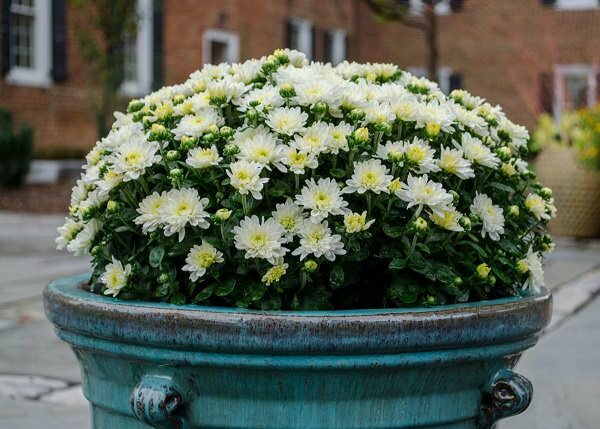 Chrysanthemums are perfect for front porches, patios, balconies, and terraces. Chrysanthemums are often grown as annuals. 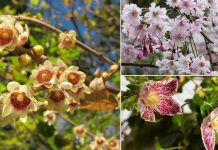 For growing in the ground is only possible with suitable varieties with small and medium-sized flowers, differing resistance to frost. They reach a height of 30 – 100 cm. Why Chrysanthemums Bloom in Fall? Chrysanthemums are short-day plants. In autumn, days become shorter and shorter, resulting in a change in light. Chrysanthemum shifts away from vegetative growth to generative and starts to bloom. Growing mums is easy as they’re undemanding for soil conditions and low maintenance and suitable even for novice gardeners. Plant chrysanthemum in pots a the same depth in which they were grown in a previous pot. The potting soil must be well drained and loamy and airy. Additionally, you can add 1/3 of compost and other organic matter into it at the time of planting. After planting, water generously for 1-2 weeks, so the plants will establish well. The position should be clear and sunny. 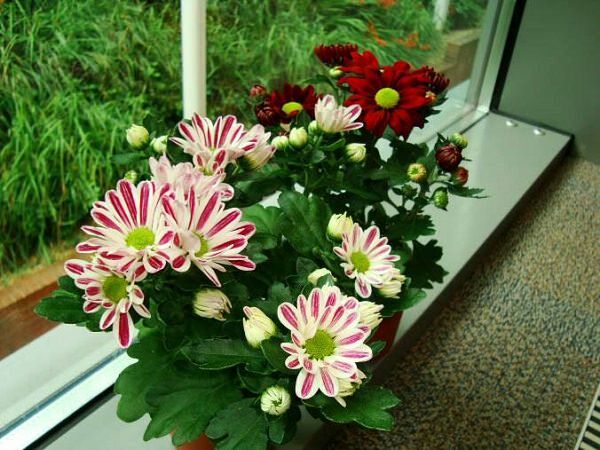 If growing mums indoors, choose a spot that receives at least 5 hours of direct sunlight daily. Don’t pack the pots tightly to maintain the proper air circulation. As chrysanthemums have a shallow root system, they are exposed to fast drying that’s why regular watering is recommended. Keep the soil slightly moist but not wet. 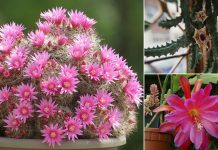 Feed the mums before the flower buds form to promote healthy roots, bud development, and a vigorous plant. You can either apply 12-6-6 slow release fertilizer during the beginning of growing season or balanced liquid fertilizer according to the product’s instructions once in a couple of weeks. Pests like leaf and stem miners, chrysanthemum eelworm, aphids, caterpillars, worms affect the mums. Diseases like gray mold, powdery mildew, and root rot infect it. Carefully remove the faded flowers to encourage more blooms. Prune dead branches and discolored leaves. Pinch your chrysanthemum plant when it’s young to encourage bushier growth and more blooms.